1. Two posts in two days, can you even HANDLE it? I'll pretend that my semi-frequent updating is due to me getting my s*&# together, and has absolutely nothing at all to do with wicked third trimester pregnancy insomnia. I mean, what else am I going to do when I wake up at 4:30am, a mere 5 hours after I fell asleep? Okay, I suppose I could find something to watch on Netflix, but at least by blogging I feel somewhat productive. 2. Colorado weather is really throwing me for a loop. We had some gorgeous days here this past week; sunny, in the 80's, perfect pool weather....and then the rainstorms began. Pre-kids, there were few things in life I loved more than rainstorms. Storms meant spending the afternoon in a coffeeshop or Barnes and Noble, a latte in one hand and a book or my journal in the other. Now? I dread storms. Every time we hear a clap of thunder, Alessandra shrieks, "oh no!!!" and runs and buries her face in my shoulder. Okay, so that's actually very endearing. Storms bum me out now because my kids get bored FAST, and there are only so many activities around the house I can offer up that we haven't done a million times already. By mid-afternoon, everyone is crabby. 3. Determined not to let the constant rain get to me, however, I rounded up the kids a few days ago, and purchased a kiddie pool from Target. I had my eye on a simple but sturdy-looking inflatable pool that was big and safe enough for both kids, but Tony somehow managed to talk me into the "super cool" kiddie pool with a slide, a palm tree, and a sectioned off splash area. I had a hard time saying no, especially since this bad boy was on sale for $28. 4. I'd like to take a moment to personally thank the Target employee who assured me that this particular pool came equipped with a manual pump. Anyone want to take a wild guess as to what WASN'T included in the box? 5. I can neither confirm nor deny that there is a picture of me flipping off the un-inflated pool in our backyard, while my kids whined and cried a few feet away. 6. Fortunately, all those Army moves over the past 10 years were good for something. We have air mattresses galore in this house (anyone want to visit us in Colorado? We have a variety of sleeping arrangements for you to choose from, and, umm, rain. Lots of it). Air mattresses have electric pumps. Electric pumps actually work pretty well for kiddie pools. Unless, of course, you were expecting to inflate the slide and palm tree as well. Then you're out of luck. 7. No matter! The husband, who has been absent these past few weeks due to field training, will be home in a matter of days. After an appropriate amount of time to recover (I'm thinking half an hour, tops), he will be available to do all those husband-y type things around the house that need doin'. I'm sure he absolutely can't wait to return home and blow up palm trees and hang curtain rods. Happy Weekend! 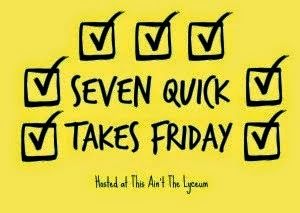 For more Quick Takes, visit Kelly at This Ain't the Lyceum.